There is only one big cycling news story today.. Even if Tony Martin somehow manages to muck up the Men’s ITT over at the World’s in Ponferrada, the screaming headline of le jour is that Giant Shimano – home of one Marcel Kittel – is teaming up with a turbo-charged German shampoo company next year and will be known as Giant Alpecin. It truly is a match made in Hair Heaven. 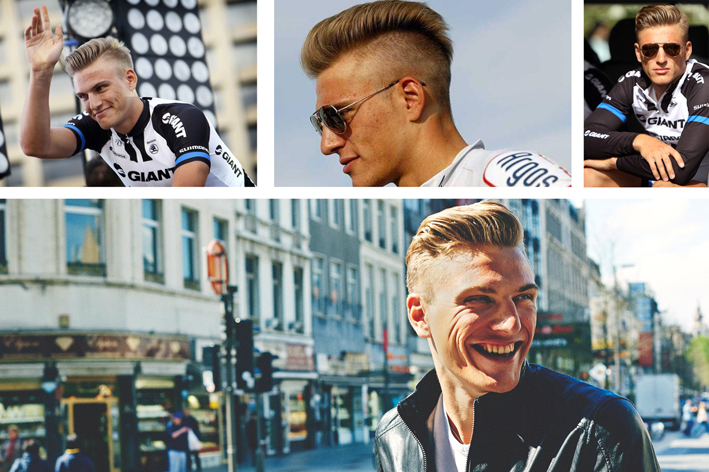 I wrote a piece recently in praise of Kittel’s coiffure – The Jersey Pocket – Hair of the Cog – and managed to shoe-horn in a sentence about how balding Alejandro Valverde might benefit from a move to the Pro-conti Alpecin team. A jokey one-liner. Three weeks later we have something akin to the mountain coming to Muhammed and the whole of the cycling Twitter-verse is engaging in hair-based puns and barnet banter. The burning question now is whether @Giant_Alpecin adopt the Giant Shimano #keepchallenging hashtag or whether they choose change it to #keepfollicallychallenging. As I said before – you hair’d it here first folks. This entry was posted in Pro cycling, Style and tagged alpecin, giant shimano, hair, procycling. Bookmark the permalink. 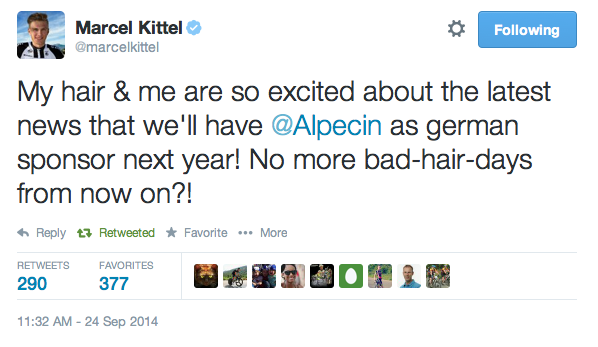 Because, after all, Kittel is known for his bad hair days (!). Nice predictions by the way – you’re clearly ahead of the curve on this one. Or should i say ‘head & shoulders’ above the r…..